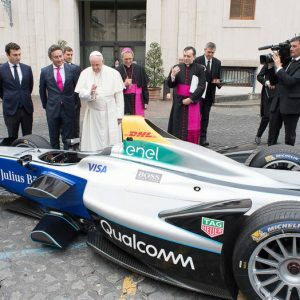 Yesterday’s (Saturday) inaugural Formula E motor race in Rome was given a papal blessing earlier this week. Race car drivers, mechanics and team representatives met with Pope Francis at the Pope’s Santa Marta residence on Wednesday. Formula E features high-performance streamlined cars similar in appearance to Formula 1 motor racing cars, with one chief difference: the racing cars are electric powered, so they are less noisy, have lower emissions and are much more environmentally friendly. The race series also helps to promote the wider use of electric vehicles generally. Approved by the Fédération Internationale de l’Automobile (FIA), motor racing’s international governing body, Formula E, officially known as the ABB FIA Formula E Championship, held its first race in Beijing in September 2013. This year, the championship will involve races in ten cities on five continents. Saturday’s race in Rome was the first time a Formula E event has been held on the streets of the Eternal City. It will be interesting to see how the Italians take to this electric-powered version of motor sport in the land of Ferrari and Lamborghini. Racing these electric vehicles competitively helps improve the performance of both carbon neutral engines and car batteries, which will benefit both the ordinary motorist and the natural environment, something which the Vatican’s press office said is in line with the environmental message outlined in the encyclical Laudato Si’ – On the Care for Our Common Home. This year, Formula E races involve 20 drivers competing in 10 teams and it is reckoned that more than half of those competing in Rome were at Santa Marta to receive the Pope’s apostolic blessing.